Mad C was born as Claudia Walde in Bautzen, Germany in 1980. Throughout 20 years of © MadC, Photo: Aim Pé constant engagement with graffiti and street art she worked her way up from a teenager with a spray can to one of the world's top street artists. 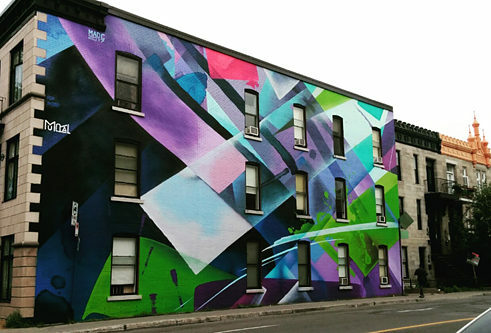 She holds degrees in graphic design from two universities and published three books about street art. Her canvases in acrylic and water colours have been exhibited both in solo and group shows worldwide – but she also always had this special immediate connection with the street itself which shows in the numerous colourful murals she has painted around the world. The 500Wall in Leipzig, Germany, the Lady Digby mural in Dulwich, London, the Theatre Jean Vilar mural in Vitry near Paris or her latest work, painted as a guest of the prestigious Mural Arts Program in Philadelphia, PA all show her distinctive transparent calligraphy style and vivid, strong colors. Recently, Mad C put up a dynamic installation and presented a walk-in interpretation of her artist home in yet another solo show in Paris, France. Her work’s focus lies in dynamic calligraphy and transparency where all layers shine through and thereby capture the energy of painting in the street without using a direct graffiti language. Mad C’s work has been covered by various magazines and newspapers such as National Geographic, Saatchi Magazine, GQ, The Guardian, Der Spiegel, The Source, GraffitiArt Magazine and many more. 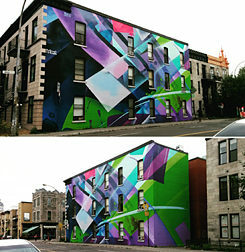 In June, Mad C was invited by MURAL to paint a large piece in Montreal. She wrapped it around two corners, with its lines matching the corner across the street. Mad C: I dedicated the mural to Ingrid Beazley and placed her name up high, so I hope she can see it from above.